On the dashboard is now less clutter so you can concentrate on your content. With Facebook access, Buffer have upgraded your browser extension automatically. Links are now shortened automatically and the new editor allows you to attach links and see thumbnail previews just the way you are used to doing in Facebook! 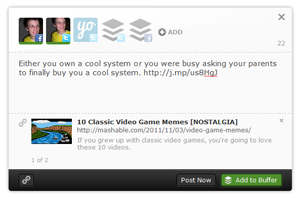 Timelines show attached links and pictures when posting to Facebook.